Donald Trump just won the GOP New Hampshire primary!?! We won’t lie: we had to pinch ourselves when the results were announced. This puts Trump one step closer to winning the White House and running our country into the ground. 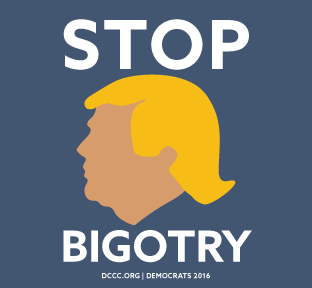 Now more than ever, it’s vital that we join together to stand against Trump and the hatred that his campaign represents. We’re doing everything we can to fight against the anti-immigrant, anti-Muslim vision of America that Trump has placed at the core of his campaign. We know how proud our Democratic supporters are to support women, people of color, the LGBT community, and our nation’s seniors. The DCCC must be upset that Trump married a good looking , legal, immigrant.